What country won the first-ever FIFA World Cup? Hint: They’re in the World Cup this year, and won their first match. Take a look at the fantastic graphic above. What are those “regional confederations” color-coded at the top? Teams competing in the World Cup must first qualify through football (soccer) organizations grouped by geography. The confederations are largely grouped by continent, with CAF and UEFA, the African and European organizations, boasting the most member organizations (national teams) and UEFA allotted the most available slots in the finals. Regional competitions for the 2018 World Cup began in March 2015 and ended in November 2017. There are 32 teams in the World Cup this year, but starting in 2026, that number will increase to 48. Union of European Football Associations (UEFA). Fourteen teams qualified from UEFA. Oceania Football Confederation (OFC). No teams qualified from OFC. 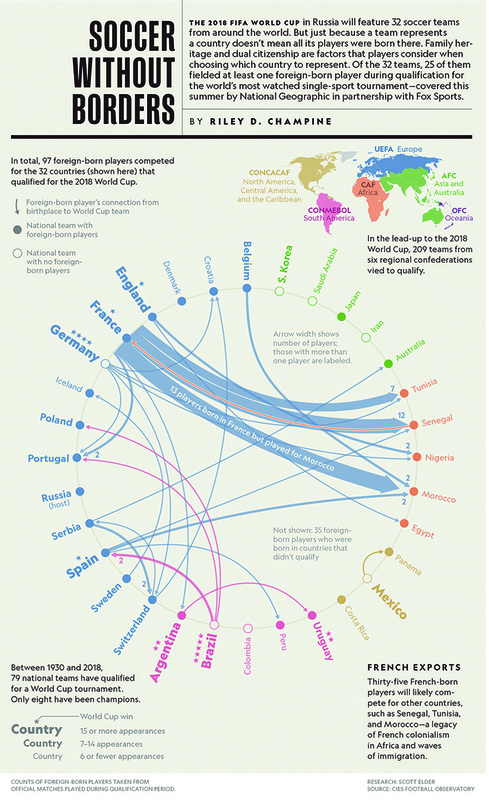 What national teams have the largest number of foreign-born players? Take a look at the graphic for some help. What patterns seem to emerge when considering foreign-born players on national teams? legacy of colonialism. Players born in countries with significant colonial history and migration between administered regions and the “home territory” account for many foreign-born players: France and Senegal, the United Kingdom (including England) and Egypt, Portugal and Brazil, France and Tunisia. Why might these patterns not be statistically significant? Take a look at the smart language inside the circle for some help. The sample size is far too small. The World Cup features only the most elite national teams, qualifying from hundreds that participated. An academic analysis would consider the entire FIFA ecosystem, not just the 32 teams competing in the World Cup. How can a player born in one nation play for the national team of another? It’s on page 70 of the FIFA statues here. The player’s biological mother or father was born in the relevant nation. The player’s biological grandmother or grandfather was born in the relevant nation. The player has lived continuously for at least five years after reaching the age of 18 in the relevant nation. FYI: Once a player has represented the national team in an official competition (such as the World Cup), the player may not change nationalities.